*The SwimFin was given to me for the purpose of a review, but all opinions, as always are my own. It was my goal leading up to this Summer (which is now finally here), to start to teach Ezra how to swim, and arm him with some much needed water safety skills. With everything that has been going on, pregnancy then, new baby, moving, building and everything else, I actually hadn't taken him to the swimming pool since last summer, and for a two year old, thats almost half his lifespan ago. 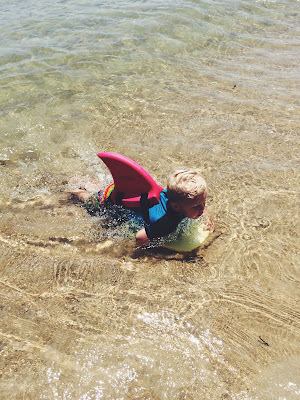 So it is safe to say that his swimming skills and water confidence were severely lacking. This was a constant worry to me considering how close we live to the water!! I would have nightmares about him falling in and him having no idea what to do. 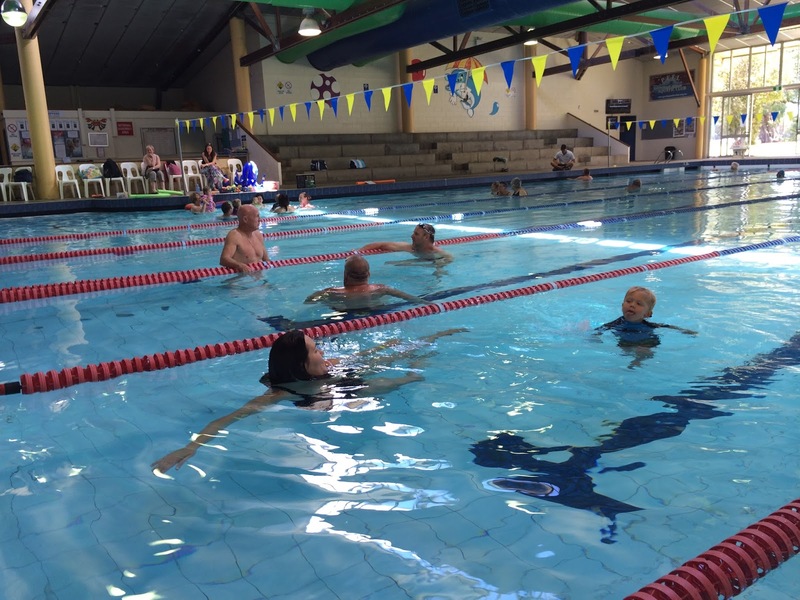 So, a few weeks ago I embarked on this swimming challenge. And I am utterly amazed at the results. 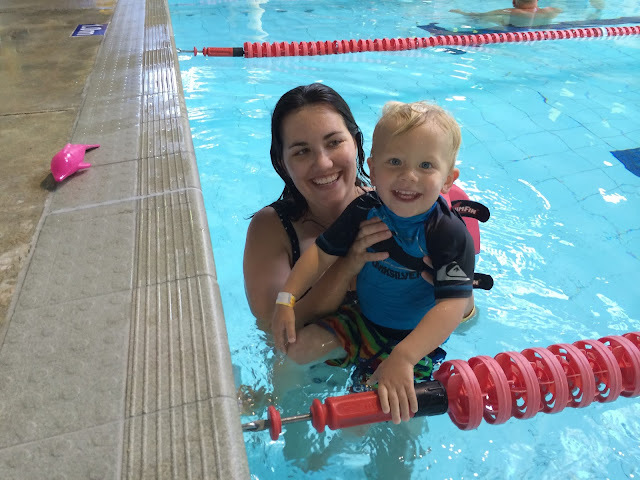 The second time we went to the pool, Ezra swam EIGHT laps of the 25 metre pool ON HIS OWN! WHATTT!!! And even though I'm a qualified swimming teacher, I mean, I'm a pretty good swimming teacher, but I'm not that good! It was really because of the SwimFin. The SwimFin is a learn to swim aid, flotation device and a great pool toy, that looks like a shark fin! From the moment I pulled it out of the packaging he was so excited about wearing it. He LOVES fish so much. On many occassions instead of bedtime stories we often read the fishing guide books. As a result he was more than happy to let me strap his FIN in on his back (which we all know can be half the battle, just getting a two year old to try something like this on). I asked him if he was a Shark, to which he promptly told me NO Mummy... WHALE SHARK! Oh Ok, he likes to be quite specific! He was extremely tentative when we first entered the pool. His arms clung around my neck and he screamed any time he thought I was going to try and pry him off of me. But, by the end of the first visit, he was happily kicking and blowing bubbles and pretending to be a whale-shark up and down the lane as I swam backwards (getting some much needed exercise myself) and held his hands. His confidence soared! The SwimFin allowed me to just hold his hands as it kept the rest of his body buoyant allowing him the freedom to kick around and get a feel for the water and how to move in it effectively. During our second trip to the pool I let go of one of Ezra's hands and he suddenly realised that he could keep himself afloat as long as he continued kicking and paddling with his arms (he was doing what I would call Dog paddle). Once this was discovered, he let go, he didn't want me to help anymore, he kept pushing me away, and off he went swimming away from me, so determined to do it on his own. I kept saying it was time to leave, and he would just turn and swim the other direction, yelling 'no, this way'. He also decided that he could jump in off the edge by himself and pop up out of the water. I couldn't believe this was my clingy child from a week ago. We are still working on the confidence at the beach. Obviously it is a little more intimidating that the pool, because it moves and there is nothing to hold onto! But, this last weekend he was walking out to the deeper water and when the sand dropped away under him he was swimming back to shore and trying to catch little waves. I still cannot believe how quickly it has taken him to go from pretty much a non-swimmer, to swimming up and down the lanes by himself, and obviously I am within reaching distance at all times incase something happens because that is just common sense. The really great thing is that now I am pretty confident that even if he fell in the water without the SwimFin on, then he would know what to do with his arms and legs to try and stay afloat, and that would give us valuable seconds to rescue him! That is a huge peace of mind for me. What I love about the SwimFin. - It is fun! Which is one of the biggest tips I can give in teaching kids to swim: make it FUN! - It gives kids freedom in the water, its so hard for them to learn to kick if you are grabbing them around the waist. - It leaves their arms free to paddle as needed. - When they get better at swimming on their own, you can use the SwimFin to help teach correct swimming strokes because it doesn't get in the way. If you are stuck for Christmas present ideas for kids, this would be the top of my list! 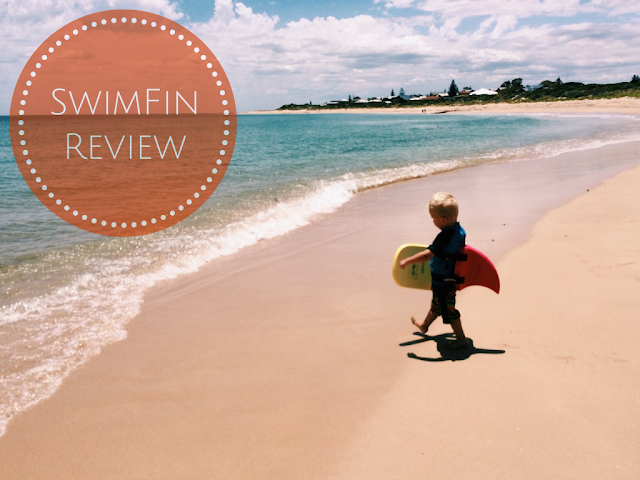 I have nothing but great things to say about the SwimFin, we really love it! If you are interested in a more detailed post of Ezra's swimming progression with the SwimFin let me know because I will write it if there is interest!! 8 comments on "Teaching Kids to Swim: SwimFin Review"
I definitely think this would be a worthwhile purchase for my kiddos. You have me sold! My favorite part of the post is the pics. Ez is adorable, then add the swimfin and it's too much! 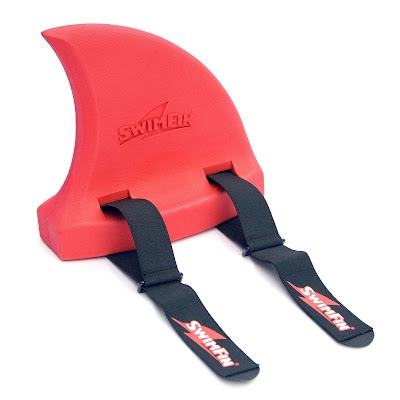 Seeming you are a qualified swimming teacher, do you think this fin would help? I am also hoping to start swimming next year with my 3 yr old, who is also severely lacking confidence and spent our last pool visit with his arms and legs wrapped around me! Not personally knowing your daughter it is hard to say exactly, but I would say that the swimfin would help most kids gain confidence, even a 4 and a half year old. Just having the security of knowing something is going to help her might make a difference. Confidence and getting used to the water is one of the most important things I've found, so regular pool or beach visits just for fun will really help too! Thank you - I agree that regular pool/beach visits will also help, and we are hoping to do that over the Xmas break. I generally don't get to the pool with both kids as I can't fully supervise them by myself. I think I will get a swimfin and give it a shot. If it proves popular/useful with both, I can always get another further down the track. When Do I Find The Time To Blog?